This is my standard 'new baby' knit because I think its such a useful item of clothing to have. I decided to call this pattern the Kauri vest, because the top part of the ribbing reminded me of tree trunks. The Kauri is a native New Zealand tree that grows very large. 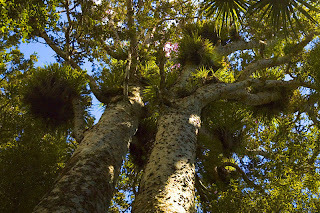 Its a kind of NZ version of the phrase 'mighty oaks from little acorns grow'. Such a sweet little vest, very cute. Really cute. I miss knitting for babies! It is so rewarding. yes--the pattern is not here. If you click on the word "kauri vest pattern" under the first picture, it will take you to the google docs for the pattern. I hope that makes it clearer.